This is the last session of the 16th Lok Sabha with elections due by May. 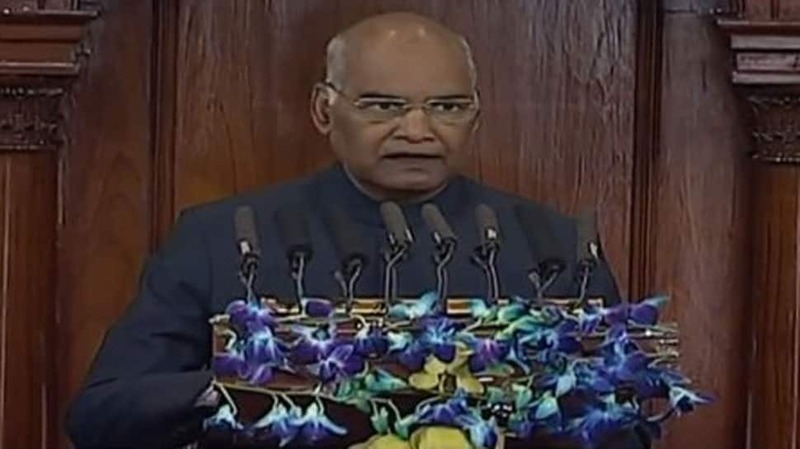 New Delhi: Addressing the joint session of Parliament at the beginning of the Budget Session on Thursday, President Ram Nath Kovind said that the government is committed towards its resolve to work for making a New India and give hope to the people. This is the last session of the 16th Lok Sabha with elections due by May. The Budget session will end on February 13. He said the government has been trying to pass the triple talaq bill to empower Muslim women so that they can live a life without fear. He also emphasised that Citizenship Amendment Bill will make it easier to provide Indian citizenship to those who had to take refuge in India after facing oppression somewhere else. President Kovind also highlighted various welfare schemes and initiatives taken by the government. Under Pradhan Mantri Sahaj Bijli Har Ghar Yojana (Saubhagya) Yojna, 2 crore 47 lakh households have been given power connections so that the poor people are lifted out of darkness. Healthcare is my government’s topmost priority. I am happy to inform you that the benefits of government’s schemes are reaching poorest of the poor.